In the spirit of the growth of this site and expanding my horizons, let's talk about other tech than just Android. Today I'm going to show off something that most Android users would still need to have - some 'computer'. As much as we can do just about everything from our mobile devices these days, there are just some things we need to do from some typical desktop/laptop. 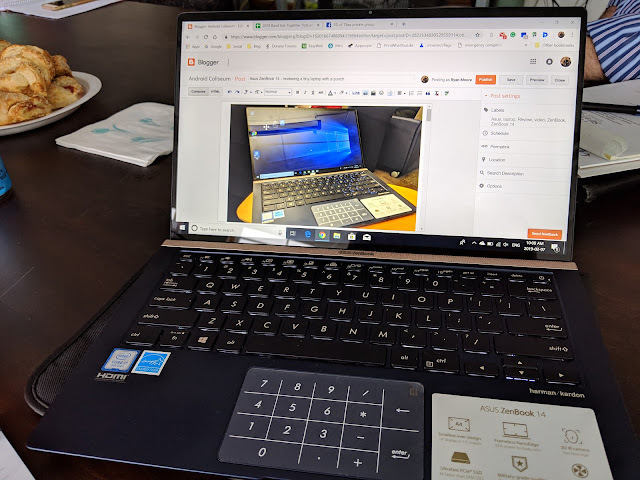 I know because whenever I post a review of a Chromebook or tablet you tell me (I see you Chris!). 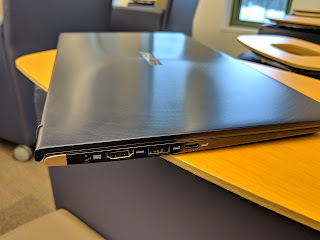 Today's laptop comes from Asus - the new ZenBook 14. I had reviewed one of their VivoBooks before and it was alright - pretty basic, whereas the ZenBooks are more their 'premium lineup' - the device I got to review from Asus was their i7 variant, so it's got a huge punch of power all packed into a tiny little unit. But, for that size, it's no cheap device - via BestBuy you're looking at $1500. For a tablet, my usual area of expertise, that's hefty. 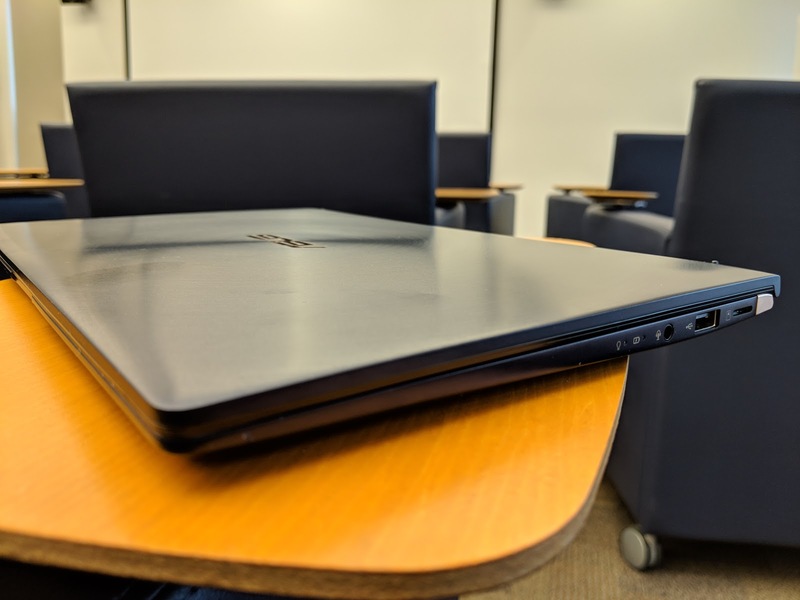 For laptops, that's not too out of the norm for the specs. I can't seem to find a price for their i5 version, so you might spend a few bucks less for it but other specs could be debuffed too. 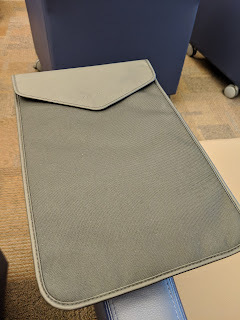 Best of all... and I'm being a little glib, is that in the box, there is an actual sleeve for you to put your laptop in it. That's great because this is a sleek little number. It feels only slightly larger than the old netbooks I had once. So you will want to find a way to protect it if you're putting it in your messenger bag or purse. Be a shame to scratch the nice looking finish. Surprised actually to see it listing that it had the MIL-810G standard... still, I don't think I'd give it to my son to play with. But good to know it has some durability to it being so teeny tiny. So, yeah, it's tiny. 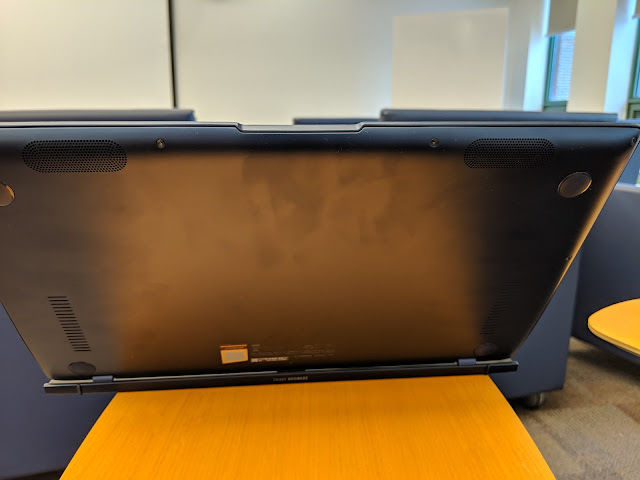 Super easy to pick up and walk around with that it's a bit of a surprise when you open it up and see a 14" screen. For its size - it's quite deceptive ... almost immersive. They do that by using their NanoEdge display - meaning it has a 2.9mm bezel (3.3 on the bottom/top). It's pretty minimal and it feels like it's practically all screen (92% actually). It's a really nice screen too. 1080 sounds small compared to our mobile devices running at QuadHD, but it's fine for what I use online. I've watched Netflix for a couple of hours and I couldn't really find any complaints with the display at all. I just really REALLY wish that it was touchscreen... I've been spoiled with my Pixelbook. Dang. Speaking of staring at the screen, one of the features that Windows has included in ... not sure when, or if this is just an Asus feature was the security and being able to use your face as a login feature. Another neat feature was how the screen hinged up. The display opens up and the bottom of the screen becomes the 'feet' which raise up the laptop. 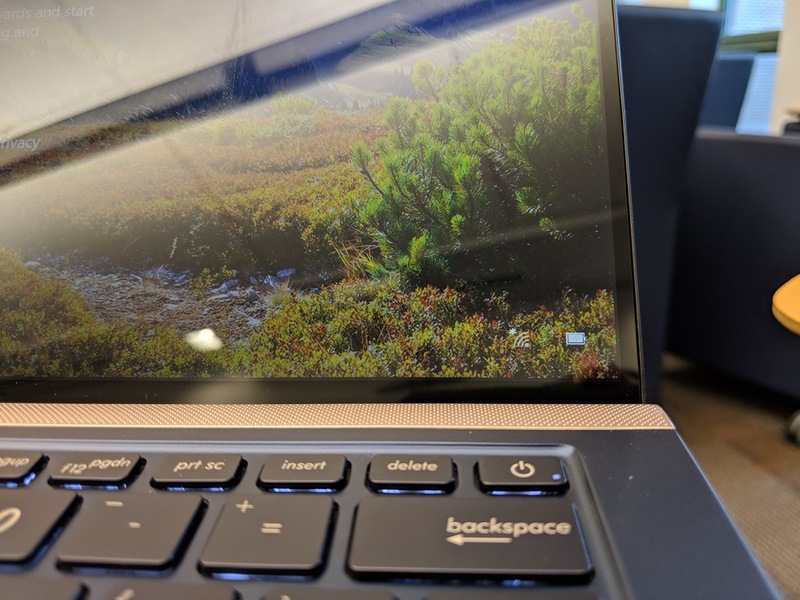 It does this for a bit of stability for the display - too often I've seen where laptop screens become loose on the hinge and as you type the screen 'wobbles'. Rooting itself on the table prevents that. It also raises the keyboard ever so slightly. Not as much as with the Vivobook and their ErgoLift ... but slightly. Which I prefer. 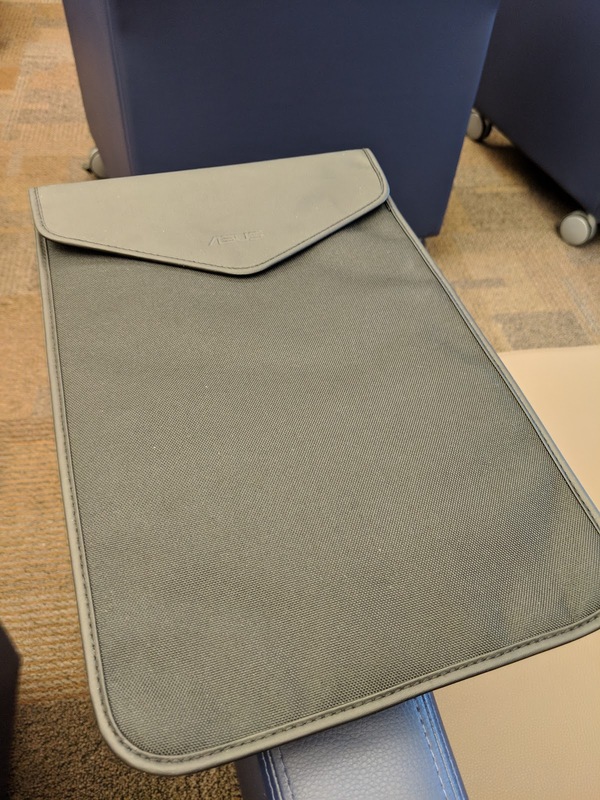 Typically, I put the laptop on the sleeve I keep it in anyway, so that's just the gentlest of lifts for me. 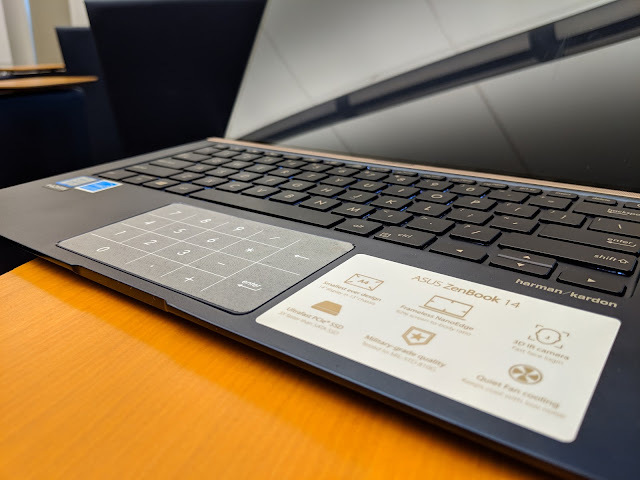 Looking at the physical keyboard while open also presents a very low 'profile'. Nice 'skinny' keys that don't really 'stand out' and are easy to type away on. 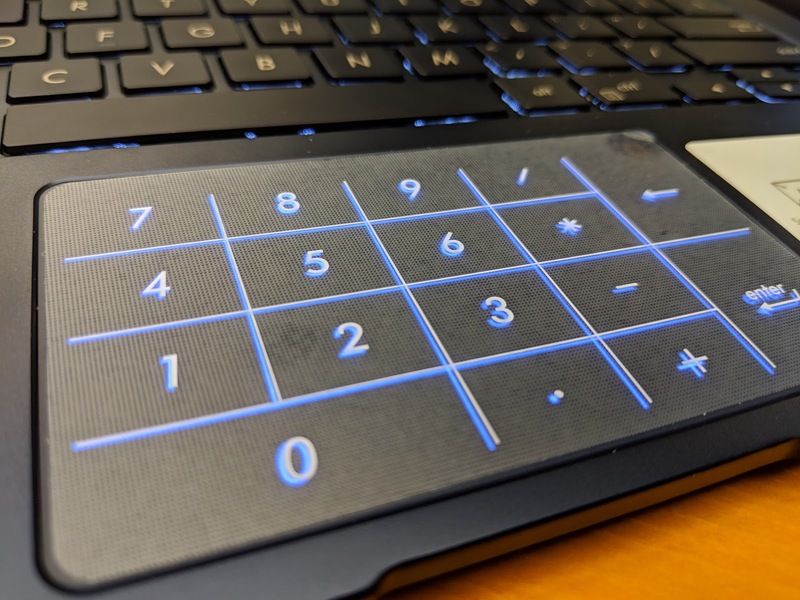 The big differentiator when you look at it is the innovative way they've incorporated a number pad on your touchpad. I don't know if it's been done before. I know there have been some Macbooks that let you do something similar. I should remove that film protector ... but it's not mine so I like to keep it as pristine as possible for when I send it back (sniff!). The way it works is that it has a grid printed out on it. Now it works as a touchpad normally - but if you long press (well long 'tap' - no need to actually 'press') the top right corner (where you see a little icon of a numpad) the grid lights up blue and each area is tappable to replicate the numpad feature. You can still move your finger around swiping and pointing... however just be cautious... it's sensitive and may just put in the number accidentally. Doesn't happen often, I'm just being overly cautious and I leave it 'off' until I need to turn it on. 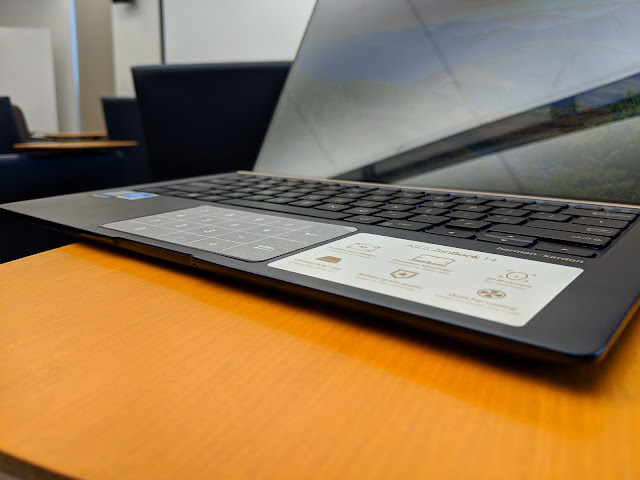 Now, it has speakers on the bottom of the laptop near the touchpad. On the video I said near the display, because of the grill, and to be honest they're so subtle it was hard to determine where the sound was coming from. They're good... just ... subtle. I tried playing some Fortnite (and still not used to playing on PC ... used to on Mobile relying on the footprint and gunfire icons to help locate items in my surroundings vs. sound only) and it was a little difficult for me to zero in on sound .. like where is that chest sound coming from? Watching some Netflix it was loud enough for me to watch my shoes but there's no way I would rely on this for any sound for a small room or web conference and have it as the sole audio option. 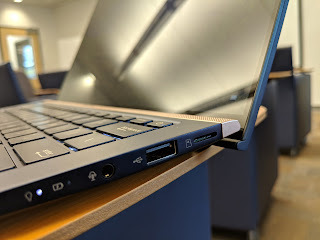 Before getting into performance of it, let me just talk also about the ports on it. It has the generic ports - a USB-A, a USB-C (which was a real life saver as I had forgotten to bring one of my many phone chargers on a trip and only had a USB-C to C cord - so instead of relying on my portable battery I could charge my phone via the USB port while in the hotel or airport lounge), microSD, full HDMI and a proprietary power plug. Again, getting spoiled with my USB-C charging on mobile devices. It'll have most of what you probably need for anything. Let me first talk about the power. Again, I wish I didn't have to carry ANOTHER charger, but that's not the worst thing in the world, the plug is small enough (I just wish the prongs were retractable to protect them in my bag). I find the charger takes quite a while to charge up to full. I had sat it down at the hotel and it took about 3-4 hours to get a full charge from about 20% or so, and that wasn't using it. So ... be prepared. Plugging in and using it, it seemed to be about the same speeds, so that was interesting. I expected it to be slower. That being said, battery lasts a good amount of time. Off charge I was able to play Fortnite for about 2 hours (I played for about an hour ... most I can take of it at one time and it was around the 50% mark). Currently, I've been using it off charge for about... I'd say 6 hours in total and I'm at 37% left and it's telling me that I have 1h37m left before empty. This has been mostly just web browsing, email ... etc... nothing heavy like videos or Fortnite. For typical 'work' users it should be able to get through a day, give or take. Your mileage might vary. Now, how about for actually chunking through the cycles and getting stuff done. How has it performed? Personally, most of what I do is online ... Netflix, Gmail, Blogger, Youtube ... nothing heavy. Chrome has been THE thing I use on it and compared to my 5 year old laptop at work it's SCREAMINGLY fast compared to that. It's noticeably faster than the Vivobook I reviewed too... this does have the i7 under the hood. It should be 'faster' than my Pixelbook, but maybe it's Windows vs. ChromeOS but I found them about similar ... maybe this is a tad faster there. Nothing surprising there. It's a hefty processor, lots of RAM and it just blazes through everything like it should. I'm enjoying it. As for something with more requirement... the only thing I push it on would be Fortnite (thanks to my 11 year old son...). Now it's definitely better performing for that game than on my iPhone 8 .. and you get way more detail (like noticing how the trees sway in the wind, or the clouds roil as the storm rolls). That being said, I had to leave the graphics settings to 'medium' for it to be as good and fluid. Pushing it to high caused it to slow down and really noticeable as you would land. Even at medium it looks fine. No complaints. Overall, this has been an AMAZING laptop. 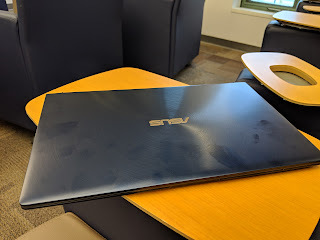 It has really replaced my Pixelbook as my daily user and I bring it with me to work every day and have been finding excuses to work remotely and plop down at cafes with it. It's great. Really going to miss it... and I've even put in to our procurement team that we should be looking at this for our deployment (we're due for hardware upgrades and have been looking for options). Sure, this is a $1500 laptop... it's expensive compared to some alternatives out there, but as far as laptops go, it's not really out of the range of what you should expect. A few years back that would be 'cheap' too. Plus if you want to go down the scale of expense, you do miss out on the better specs which brings down the experience. For what you're paying ... lots of space and RAM, huge pushing power for processing and a nice immersive screen (which is funny to say for a small 14" for a laptop). It's well worth the money. My only 'complaints' about it would be the fact that I wish it had a touchscreen and the battery charges relatively slow to what I'd hope for. Otherwise it has been a satisfying experience.